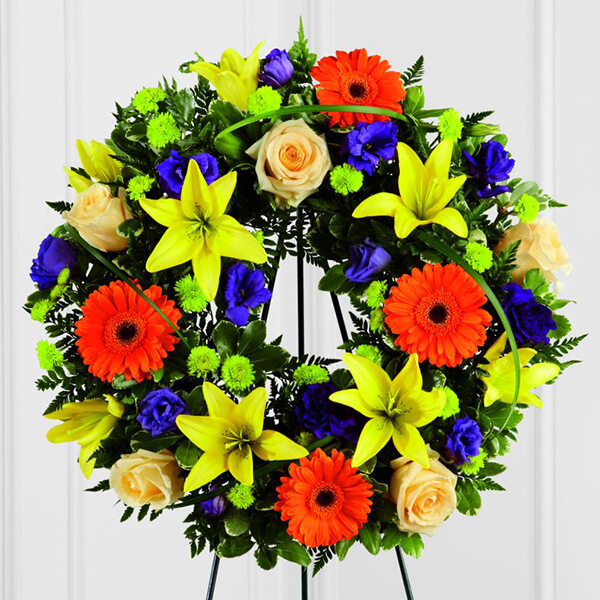 The FTD Radiant Remembrance Wreath is a brilliant burst of color and light that honors a life full of joy and beauty. CrÃ¨me de la CrÃ¨me roses create a symbol of peace arranged amongst the vibrant hues of purple lisianthus, orange gerbera daisies, orange Asiatic lilies, green button poms, and a variety of lush greens, forming wonderful representation of a life well lived. Displayed on a wire easel.